Mix pork with soy sauce, scallion, cornstarch and Sherry. Saute in small amount of peanut oil until cooked thoroughly. Cool. 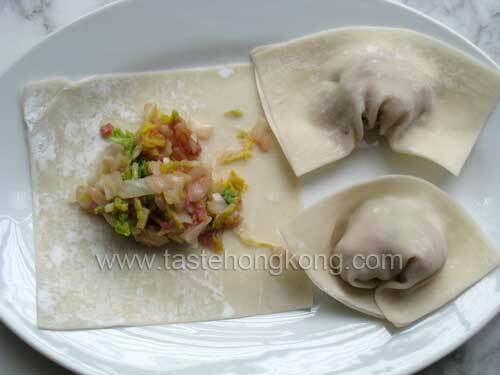 Place about 1 teaspoon of the filling in the lower section of the wonton with one of the flat sides toward you. Dip your fingers in water, then run your fingers down the sides of the wonton. Fold the lower part of the wrapper over the filling twice so that the filling is tucked in. Draw the two sides together and press the dough together. Don’t forget to get your Year of the Horse earrings from our Artfire store. Fried Wontons Heat peanut oil at least 2-3 inches deep, to 365 degrees, in a wok or deep-frying pan. Carefully lower the wontons into the oil, leaving room so they don’t touch each other. As soon as they turn golden brown, scoop them out and drain on paper towels. Continue cooking the rest in the same manner. Serve with plum sauce or duck sauce, hot mustard and soy sauce. Wonton Soup Fold the wontons in the same manner. Bring a pot of chicken broth (you can cut it with water in a two broth to one water ratio) to boiling. Add the wontons and cook until tender. You top with sliced scallions, fresh chopped spinach, extra wonton noodles that you’ve sliced and fried or left over pork filling.